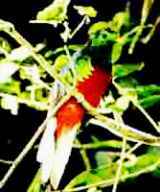 The quetzal is a frugivore, and feasts on the "aguacatillo". This is similar to a miniature avocado, of the laurel family. This is a great example of symbiosis, because the aguacatillo needs the quetzal to spread its seeds. 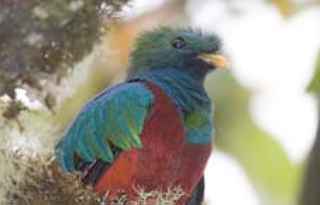 Quetzals follow the seasonal fruiting of different laurel species, so you can time your visit to this season. If you are here at this time, you can easily find them during their feeding hours, which are practically fixed. The quetzal is endangered due to loss of its cloud-forest home, especially the lower forests, where families descend during March through June breeding season. This is the best time to see the males showing off their tail plumes, their peculiar mating dance. They spiral skywards, then suddenly plummet, diving with their tail feathers rippling behind. The quetzal (resplendent trogon) is one of the most prized species for bird watchers who come to Costa Rica. The bird's coloring is truly awesome, a vivid green that bursts into flame in direct sunlight, changing from emerald, to golden, to iridescent green. The tail plumes can be up to 24 inches long. This was nothing new for the poor quetzal, who had a long history as a fashionable decorative element for humans. The Aztecs worshiped Quetzalcoatl, the Plumed Serpent, and depicted him with a headdress of quetzal feathers. The Mayans considered the male's tail feathers worth more than gold, and hunting the sacred bird was a capital crime. Quetzal plumes were the Mayans' most precious objects, along with jade. Archaeologists believe that only Mayan priests and nobility could wear quetzal plumes, as a symbol of authority.